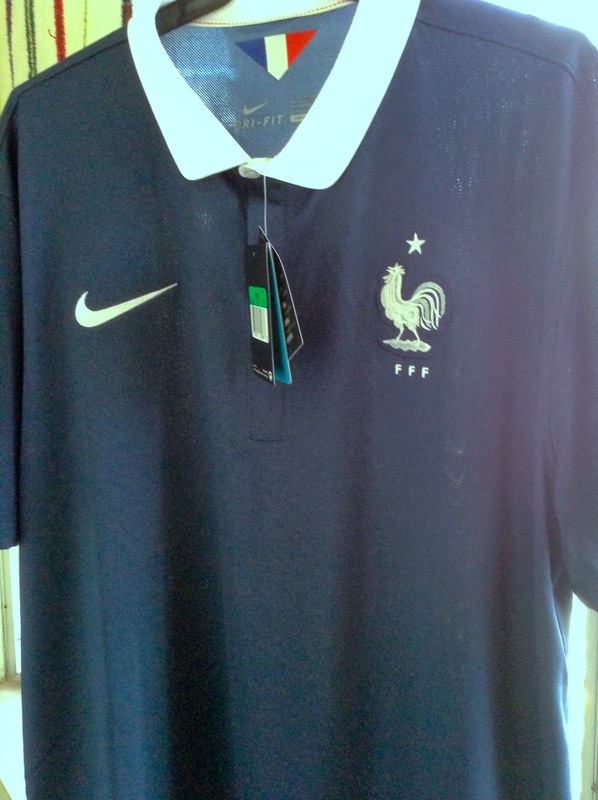 Check out the new France kit for the 2014 World Cup. It's got a simple but fresh design that is very chic and cool. 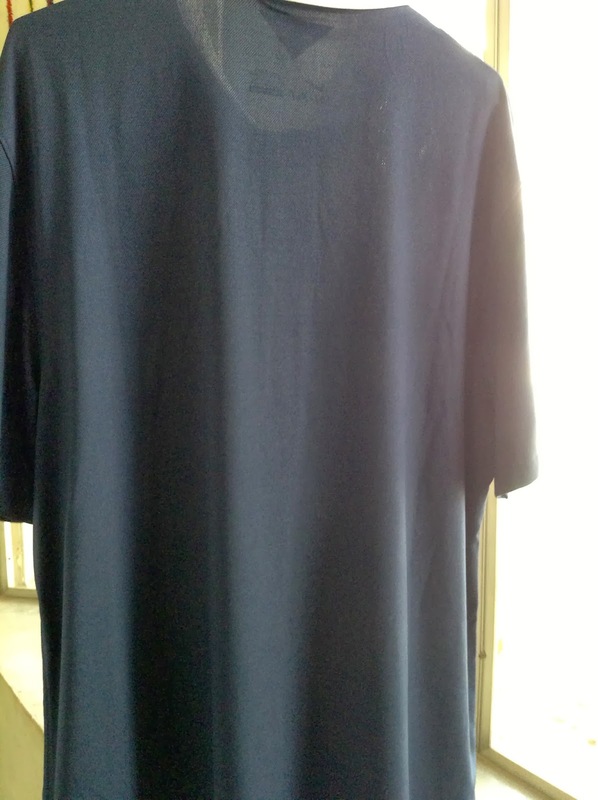 Using Navy blue colours with a white collar. The French Football Federation crest on the left and the Swoosh on the right. At the nape area, it's got the French flag! And of course, this is made in - tada - Thailand! Love the red stitches on the white collar. Who would thought that red stitches on white would make it look even more cool. All in all a cool and casual design! Something that you can wear on and off the pitch. This appears in the Monday, December 30, 2013 edition of the Business Mirror. If you’re in your 40s do you still get up for Christmas presents? I’d say it depends on what gift you receive, right? When giving gifts, I have a simple solution in trying to figure out what to give. If I know the person well, it’s easier to get him or her something because you know what they like. As for others, why in the hell do you want to give something to people you don’t really know? I’d rather just greet them. Conversely, we have a rule in the house -- give something useful if not just give them a greeting card. The unwanted stuff gets put in a closet never to be used. It’s given away later on, sold in our annual garage sale, or even worse, thrown in the waste bin. I am sorry if I have to say that but that’s how it is. And that brings me back to my Christmas present. 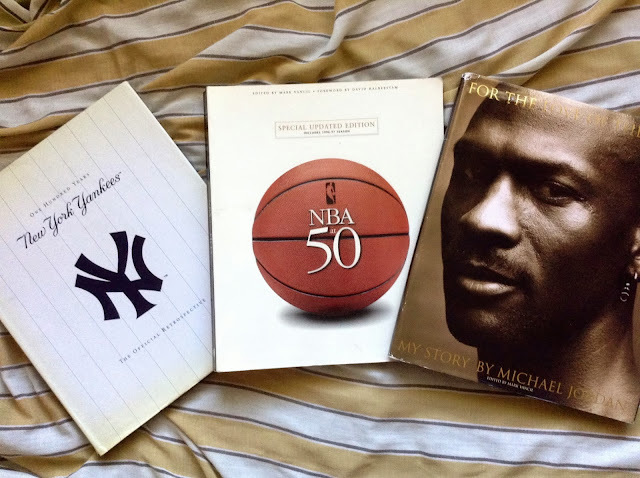 I received a pair of second hand coffee table books: For the Love of the Game, My Story by Michael Jordan, and One Hundred Years: The New York Yankees The Official Retrospective from a cousin of mine who lives in California. I once had these coffee table books that I purchased in the United States a long time ago. They have been a part of a book collection that I was proud of. Sadly, I lost almost everything during Typhoon Ondoy in 2009 when my apartment was under water. I wasn’t able to save much. My books, magazines, and compact disc/digital videodisc collection that had taken much of my lifetime to put together was destroyed. The loss and my house being looted post-typhoon left me even more devastated. Books aren’t only founts of knowledge but also signposts of the times and they hold meaning and memories like songs. I had my NBA at 50 book signed by a few NBA players while my Yankees tome was signed by Reggie Jackson and Yogi Berra in some of my first trips to Yankee Stadium. Since then I have gotten over the post-disaster depression and moved on with my life. In doing so, I jettisoned many material things after that having decided to instead concentrate on other things. But life has a funny way of taking you back. As a media practitioner, reading and viewing material is part of my lifeblood. The mind can only work so much and play tricks on you. What is on the printed page and on video sets the record straight. Early this year, the opportunity to reacquire “NBA at 50” came up. Like many of my other books, I too lost this to Ondoy. Now coffee table books have small and limited print runs. I scoured amazon and eBay like mad and to no avail. Juan Ponce de Leon probably had better luck searching for the Fountain of Youth. You see, when coffee table books are sold out that’s it. It is rare that they get another print run. You’re best bet is to go to used book stores and pray that they are available and in good condition. Mint conditions are rare and you have to pay a princely sum for them. But beggars and collectors cannot be choosers. I found NBA at 50 on the Internet and paid a small sum since it was second hand but was charged a premium for having it shipped over pronto. It isn’t a the hardbound version but the soft cover version and the cool thing is, it arrived in time for me to have a photo taken with NBA Commissioner David Stern who helped put this book together nearly a decade ago. The copy I got is the updated edition that included the 1996-97 edition to commemorate the NBA’s 50th season. The commissioner ribbed me about getting the cheaper softcover version. I said I originally got the hardcover that I lost to a typhoon. He kidded me back by saying, there are no such things as typhoons or global warming (to go with a smile). So the “new” second hand book now has the first of its new memories. The other two books – For the Love of the Game and One Hundred Years – are a little harder to procure because the suppliers do not deliver to the Philippines. That changed on the evening of December 25th when I got them as gifts from a cousin of mine in California. The books were heavy and my cousin hand carried them from LAX (she was going to be charged extra if she placed them inside her luggage). I couldn’t wait to get home that night. And once I did, I was like that kid who first purchased them at Barnes & Noble in Times Square all those long years ago. I stayed up until the wee hours of the morning reading them. To use a kid’s expression – “they were the bestest gifts one could ask”. And they sure are. At my age, I can pretty much purchase what I want. But these two books, made me happy. With a day job working at Gatorade, trying to bring Michael Jordan over to the Philippines is a crusade for my and some colleagues. If successful, my copy of “For the Love of the Game” will have its new memory. And sometime next year, I hope to make my first visit to the new Yankee Stadium. When I used to live in the Big Apple, not a week went by during the baseball season when I would make my pilgrimage to baseball’s hallowed cathedral to watch a game. It reconnected me to my departed grandfather who introduced the game and the Yankees to me when I was young. And I got to see my favorite sports team play the game and go to the World Series. Hopefully once more, I will be able to meet some of the Yankee old-timers or even some of the new players to ask for pictures and autographs. You know, make some new memories. And that’s how gifts and books should be – laden with good vibes and even more “bestest” memories. 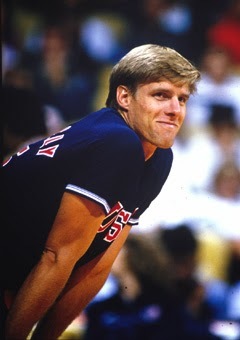 And I thought back to that great American Men’s Volleyball Teams from 1984-88 where they won back-to-back gold medals in the Olympics in addition to two FIVB championships in between. That team had the great Karch Kiraly, named the best male volleyball player of the 20th century by FIVB, the flat-topped Steve Timmons, Dusty Dvorak, Pat Powers, and Aldis Berzins to name a few. Anyone who has played pick up basketball knows that it’s okay to wear t-shirts while playing. But when it gets heavy because of sweat, you roll up the sleeves. Only these new adidas jerseys are of that adizero design where it 26% lighter than the NBA jersey that comes with a moisture absorbing feature. The sleeves are made with a stretch fabric so that when a baller goes into him jumpshot mode, it doesn’t interfere with his shot. 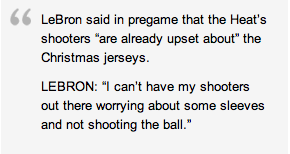 During the NBA’s Christmas Day games, quite a few voiced out their displeasure with the new short-sleeved jerseys. However, now when I have stewed on it, it’s not so bad. It will just take some getting used to by the players. Don’t those baggy shorts weigh players down as well? As someone who used to buy, wear, and collect a lot of basketball and NBA jerseys in particular, it somewhat felt awkward trying to wear them out in public. Unless I was playing a pick up game, I never wore those tank tops in public. If I did I wore it over a t-shirt. They aren’t like those baseball, American football or soccer kits that look just fine on and off the field. The new short-sleeved jerseys would look good if it were perhaps less form hugging and a little more loose or baggy. If you aren’t athletically fit, I don’t thin anyone wants the shirt to be defined by those fatty contours. That will lead to consumers buying sizes a little bigger. Maybe the league might want to consider that as well. Since we’re on the topic of jerseys – and I will keep it to the NBA stuff here – I mostly buy the swingman-type (now priced at $109.95) as opposed to the replicas ($69.95). I do have one authentic ($299.95) and that’s Manu Ginobili’s (that I got from the man himself during a game after a San Antonio Spurs game at New Jersey). Sure, the authentic and swingman versions are more expensive but they are a price you pay for quality and authenticity. 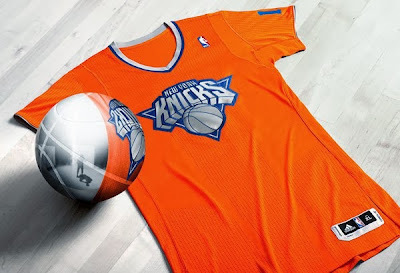 The short-sleeved jerseys are priced the same way the tank top replicas and swingman shirts. Do I count myself as a jerseyhead? Not anymore as I don’t buy too many nowadays. But here’s what I have in my collection. Judging by the reaction to the short-sleeved NBA jerseys, it doesn’t sound good. But I know a lot has been invested in them. Let’s see where they go with this. Even well before the end of a 95-78 stuffing at the hands of a depleted Chicago Bulls team on Christmas Day, the Brooklyn Nets were serenaded not with Christmas Carols but with boos and calls for the ouster of their head coach, Jason Kidd. The Nets hoped to compete with the Eastern Conference’s top teams by bringing some of the key Boston Celtics of recent years in Paul Pierce, Kevin Garnett and Jason Terry as well as former Utah Jazz star, Andrei Kirilenko. Instead of compete with the New York Knicks to be the top dog in the Big Apple, they are trying to stay afloat just like the tenants of Madison Square Garden. Both the Nets and the Knicks are at a woeful 9-19 although the former has a 5-9 at home while the latter is 4-11. It must be even more galling for the Barclays Center faithful that the other co-tenant of the swankiest and newest arena in America – the New York Islanders of the National Hockey League – are also wallowing at the near bottom of the standings with a 11-20 record (5-7-7 record at home). Now that is depressing when one of the NHL’s worst franchises in the last three decades has a 2-1 record heading into December 25. The Nets on the other hand are in the midst of a four-match that Santa’s list is only confined to who’s been naughty or nice but who has also been bad. One other galling similarity with its fellow New York teams is that Brooklyn has the highest payroll in the NBA this season. And they have nothing to show for that this season even if it is far from done. The Yankees of have had perennially the highest payroll in baseball. But they have gotten the job done with five World Series titles in the last 17 years (to go with a bunch of division titles). The Knicks… man, the Knicks… as a New Yorker, it crushes me to see my teams taking a beating. What hurts even more is that television show “2 Broke Girls” (starring Kat Dennings and Beth Behrs) started off well, saw its ratings plummet then rebound nicely with a simple change in schedule. Were it that simple with the Brooklyn Nets! You would have thought that the addition of all these big name players would have given Brooklyn a lot of firepower and big game moxie. Instead, they’re 21st in the league in points scored (96.9)! They are 18th in the league in field goal percentage shooting .444. Even something like “cupgate” where Kidd instructed Tyshawn Taylor to “hit me” in order to delay the game and to map out a final play was botched. Oh and that reminds me! Brooklyn lost the day before Thanksgiving and now they were handed another defeat on Christmas. Holidays simply do not go hand in hand with these Nets. And they are 28th overall in rebounds (40.4), 21st in assists per game with 20.5, and 23rd overall in points allowed with 102.3. A few weeks back, Kidd dumped assistant Lawrence Frank for their repeated clashes. It was reported that Kidd said with finality that he is the coach of the Brooklyn Nets and with that, it is pretty obvious that the buck stops with him (is that a bad pun because Milwaukee is their next opponent). The Nets got off to a bad start with Kidd’s DUI (driving under the influence) charge and they haven’t been right all season. Amidst further charges of Kidd’s coaching chops, chemistry issues, and mounting injuries, how can Brooklyn right their ship? They are at a point where nothing is working. Brook Lopez, perhaps the team’s one shinning spot all season long (when he suited up) is out for the season with a broken foot. While it gives the younger players like Mirza Teletovic and Mason Plumlee a chance to show what they can do, by no means will this team declare the season over. They’ve got too much veteran pride to do so. Furthermore, team owner Mikhail Prokhorov did not invest a lot of money only to throw it away. In the horrible landscape that is the Eastern Conference where only three teams sport a winning record, only a few games separate the bottom feeders from teams four to eight in the playoff race. It is a bad time to learn on the job for Kidd. Not only is his team in a bad spot but also so is he. And now the pressure has magnified because of the losing. Team management already put in a team that could supposedly compete, Lopez or no Lopez. Adding another player or two could or could not help. Maybe it’s time to add another voice on that bench to help Kidd. Just because it wasn’t Frank it doesn’t mean adding another assistant won’t work. Someone with a lot of experience and someone who knows how to help get a team to win. The moment this team was put together, the first thing they should have done is check their egos at the door. They need to do that more than ever. This appears in the PBA website. The Petron Blaze Boosters have lost back-to-back games to drop to 7-2. With center June Mar Fajardo out until January 8, 2014 with a knee sprain, the Blaze Boosters now find themselves vulnerable and scrambling to protect that rim. Although in their Christmas Day loss to Barangay Ginebra, even without Fajardo, they outrebounded their opponents, 53-48, prompting the former’s head coach Ato Agustin to scratch his head in wonder. Sure it’s a loss but one has to look at the bright side too. If Petron wants to win, they have to remember they are a team. And that means all hands on deck in protecting that shaded area and rebounding like gangbusters. Yousef Taha is their only legitimate center and he is way too raw. This kid, loaded with potential he may be, only played one season in college with Mapua before turning pro. Taha, a Filipino-Kuwaiti, was drafted 11th overall in the 2012 Draft by Air21 but midway through his very first PBA conference, the Philippine Cup, he was traded to Ginebra. Before the season-ending Governors’ Cup of that campaign, he was traded to GlobalPort. Then prior to the start of this new season, he was sent to Petron, his fourth team in four conferences. It is a dubious start for any new player. But if Taha wants to break out of his caddy status then this is where he shows what he can do. Doug Kramer is a power forward not a center. Arwind Santos is an incredible talent and can play any of the frontcourt positions but the five-spot isn’t something he relishes. Unfortunately for Petron, they are a little lean on that area. So, it’s all hands on deck. Ginebra has taken Talk ‘N Text’s formula of a tall and athletic front line and turned it into a freakish one with terrifying possibilities. They’ve got Godzilla, Mechagodzilla, King Kong, and Knifehead. It’s like a Kaiju (sorry but I am a Godzilla and Pacific Rim film fan) lineup of studs who like to host dunk and block parties. When the Tropang Texters were winning titles left and right, they had Ranidel De Ocampo, Kelly Williams, Harvey Carey, Ali Peek, and Japeth Aguilar. Now the Gin Kings have Aguilar, seven-foot Greg Slaughter, Jay-R Reyes, and Billy Mamaril to pound foes into submission. And there’s the undersized Mac Baracael. If the opponents double team, then Ginebra has the forwards and guards to burn them with Chris Ellis, Mark Caguioa, Dylan Ababou, Jayjay Helterbrand, LA Tenorio, and Emman Monfort. Lost in the shuffle is Josh Urbiztondo who is a terrific player. As for Petron, even without Fajardo, they are still a dangerous team. The loss to Ginebra was something they didn’t have enough time to prepare for. Now they do. It’s a mindset thing. They know the hand that has been dealt to them and they will figure out a way to play with it. Although they do have one more match – against Talk ‘N Text that has found a resurgent Nonoy Baclao – before Fajardo returns. Now that match is big because they don’t want to give up ground to the Tropang Texters and the other teams. With San Mig Coffee inching its way up the table, the race to the second stage of the Philippine Cup is heating up. 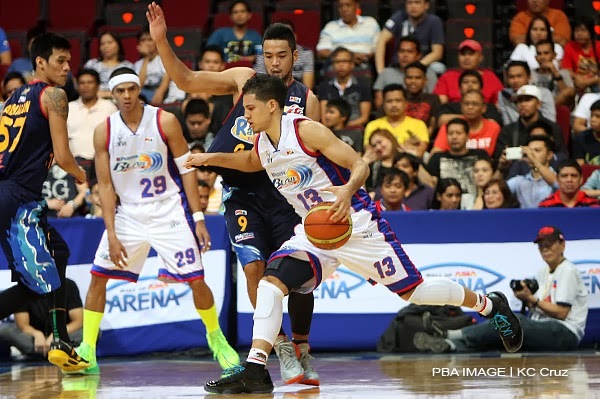 Petron should thank their stars too that Alaska and Meralco have been sputtering. The Blaze Boosters multi-dimensional players in addition to Santos who play both ends of the floor in Chris Lutz and Marcio Lassiter. The return of Alex Cabagnot cannot have come at a better time because they’ll need that stud clutch player. Putting the ball in the hoop is no problem for the squad of head coach Gee Abanilla. It’s making the stops. Do I think that Petron is reeling in the light of their misfortune? No. Not yet. With another loss, maybe yes. Having said that, this is a crucial phase in the campaign for Petron. It’s like the NBA’s Chicago Bulls – they lose their star but they just have to cowboy up. Injuries are all part of it. No excuses here. Champion teams thrive in the face of adversity. And for the Blaze Boosters to realize that, I expect them to go all out against Talk ‘N Text. This is going to be a battle royale.